Another group to enter the Melodic Rock scene, Lifeline starts off big with 'Scream'. 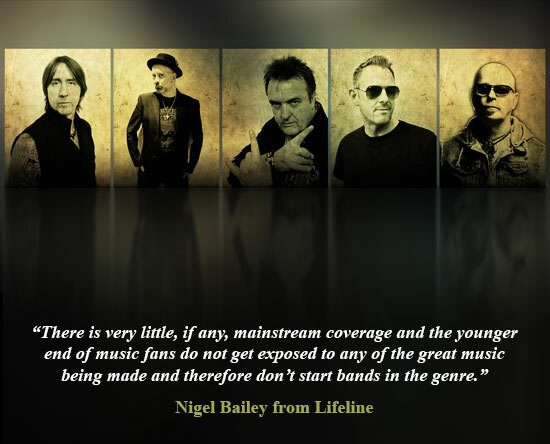 The band members Nigel Bailey and Paul Hume discussed the album and all things Lifeline with Alexandra Mrozowska. Although 'Scream' is Lifeline's debut, the musicians behind it don't need to be introduced. In what circumstances was the band formed? NB: The band was formed after I had been approached by Khalil (Turk, Escape Music) and asked if I would be interested in working with Lee (Small). Lee and I chatted and decided it would be cool to work together. We then recruited Paul (Hume), who I knew through Lawless, as producer/guitarist and drafted in Steve (Clarkson) on drums that I have played in bands with for 20 years and my brother Andy (Bailey) on keyboards. Recent years saw emergence of many Melodic Rock super groups. What do you think it's caused by? How do you feel about reviewers comparing your present work to whatever you've done in the past? NB: I'm fairly new to the business but my take on it is that there is very little, if any, mainstream coverage and the younger end of music fans do not get exposed to any of the great music being made and therefore don't start bands in the genre. The fans want to hear new material so putting together known artists in a new collaboration keeps the music coming. As for the reviews, I guess it's inevitable that comparisons will be made. I'm pleased that people like yourself are taking the time to listen and put their thoughts out there. PH: Also I think people who loved the genre in the '80s kind of went off the scene due to marriage, kids, mortgage etc.. And now the kids have flown the nest and money is a little easier they want to get out and live a little again and of course relive their youth of the Eighties... and so are drawn to Classic Rock again. Thankfully, there is a market for Classic Rock music again. While making the album, have you experienced any kind of difficulties arising from the band having two singers? Was the co-operation as smooth as it appears? NB: I can honestly say that myself and Lee never had a cross word, we get on very well and the songs dictated who sang what part. It was really easy to decide where we were going to sing. Paul might have a different view though (laughs). PH: (laughs) Yes, Nigel is correct. There was no problem choosing vocal parts so long as they agreed with me (laughs). What did the songwriting process behind 'Scream' look like? NB: On this album I wrote all the songs. As it was only myself and Lee at the time I set to work and I have been very lucky that I was able to write the kind of music I like. I write songs as they come, be it a hard rocker, ballad, AOR, whatever. I was conscious that there would be two vocalists though, so that obviously played a part. Although some see Melodic Hard Rock as the product of the '80s, the sound on 'Scream' is by no means outdated. While making an album, were you inspired by any of the young, contemporary Melodic Rock/AOR acts? NB: To a certain extent I think so. I listen to rock radio stations and CD's all the time, there is always music on in the house or car and I think you are influenced by everything you hear, consciously or not. I think that this album in particular, shows a lot of my 70's and 80's influences but with a modern twist. Once we were in the studio we wanted to try and capture a "band" feel and Paul did a great job with that. PH: We really wanted to create a band feel to the album and steer away from the crushed studio sound that is so prevalent today. I think we achieved a good mix of the two styles. Can you please take us through your personal highlights of the album? An upcoming video for 'Jezebel' is going to be a special one as you intend to build it around the video footage received from your fans. What's prompted such an idea? NB: We thought that it would be fun to do something different than the band on stage thing. We had a great response and have fans, friends and lots of well known artists who sent us footage. It turned out really well. We're also planning a full video shoot for a second song. I think videos, either on YouTube or through Facebook etc. are essential to get any exposure and to try and broaden the audience for your music. In early 2016 you're going to play at the ARFM/Just Say Yes Rock January event. Is it the first time the band hits the stage together? What are your expectations? NB: It will be the first time that we play live as things stand. All of us, with the exception of Lee played the show last year, Paul with Lawless and myself, Andy & Steve with Bailey so we know it will be a great event for a great cause and we intend to put on a great show! Do you plan to go on regular tour, or will it be more about occasional performances? NB: No plans as yet – we would love to play more live shows, festivals, support slots, but we have to see what comes up. It's difficult to tour on the back of first album as none of us really want to add too many songs from the other bands we are part of. Is it difficult to reconcile Lifeline and your other projects? What other things are you up to currently? NB: Not really, I started late but hope to make up for lost time and am loving every minute! We are working on a second Three Lions album and I am hopeful of a second Bailey disc. I'm also going to be playing at Rockingham with the guys from the Bailey live line up as Stan Bush's band on the Sunday which we are looking forward to. I have written some songs that will feature on other artists albums in the near future, it's been busy, but busy is good.